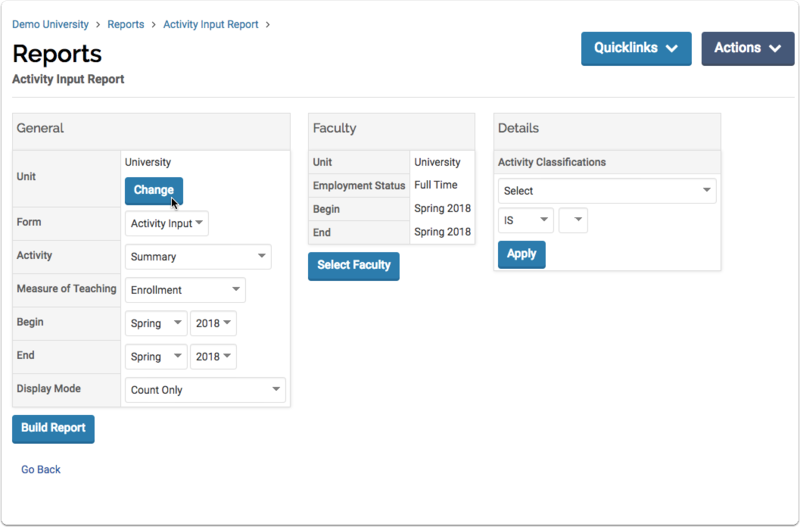 Various activity, administrative, and accreditation reports can be generated within FACULTY180 for information purposes, based upon a user's permissions. For example, a provost might have permissions to access all reports at the university level and below, while deans might only have access to reports for their colleges. Once a report has been generated, it can be exported to Microsoft Word/Excel format or Adobe PDF. Reports can also be printed on a standard printer. To access reports, from the Admin menu, click Reports. There are two basic components to running reports. Selecting the faculty and selecting the data to include in the report. Additional options may be available, depending on the type of data in the report. Faculty: use the Faculty Selection Tool to select faculty to include in the report. General: use the settings in this section to select the data to include in the report. Details: use Activity Classifications to filter data in the report. 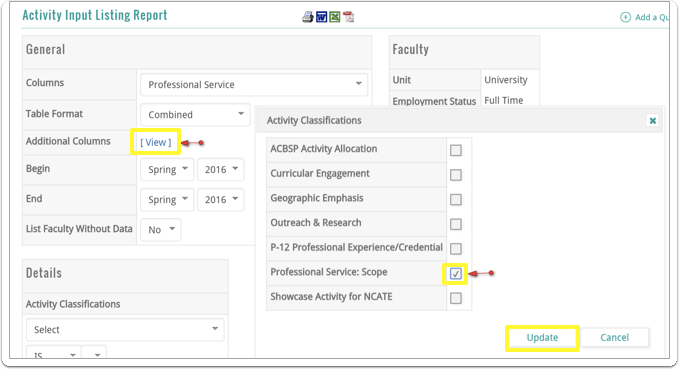 Build Report: after selecting faculty to include in the report and selecting data to include in the report and applying additional filters as needed, click the Build Report button. 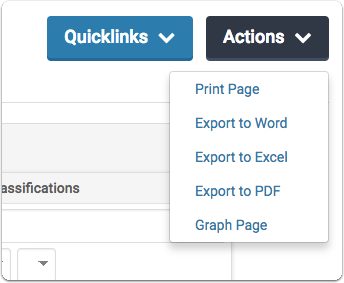 Add a Quicklink: select to add a link to this report screen for easy access. Print, Export, Graphing options: select the appropriate option to use the report. There are several options to drill down to the source data of the report. Click on any hyperlinks that are available to see a different view of the data. Clicking on the numeric totals will display data by faculty. Clicking again on the numeric totals will display the source data by faculty. To add activity classifications to the report, click on[View]and select the classifications to add. Then, click theUpdatebutton. To sort the data in the report by a particular column, click the column heading. The report is sorted by the selected column. There are several options to output the data. The icons at the top of the page can be used to print, export to Word, export to Excel, and export to PDF. Graphing is also available for some reports. Note: If the report has been sorted, the sort applies only to the display the sort will not be reflected in the export options. If a different sort order is desired, the data should be exported to Excel, where the sort order can then be modified. Profile Report: Personal information, work experience, degrees, licenses, memberships, honors, interests, biographies, and more. Activity Input Report: Teaching (e.g. enrollment, credit hours), grants, service, professional development, consulting, and more. Scholarly Activities: Research, publications, and creative productions. Grants: Grant activities and funding data. Courses Taught: Enrollment, credit hours, teaching load, and course sections. Activities By Activity Classification: Activities grouped by classifications. 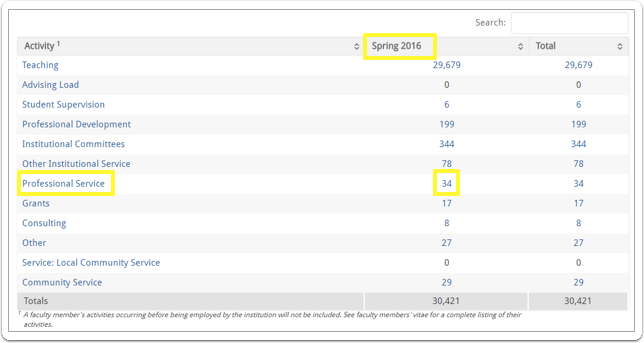 Ad Hoc Reports: Report building by selecting data to represent each column: faculty information, faculty classifications, activity input counts, and profile activity counts. Activity Overview - By Faculty: Activities by units and faculty members within those units. 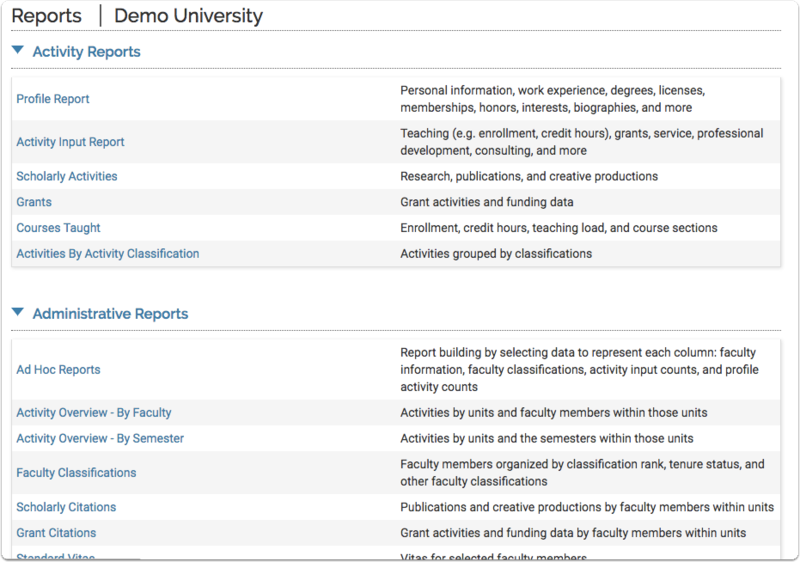 Activity Overview - By your institution's academic term: Activities by units and the academic terms within those units. Faculty Classifications: Faculty members organized by classification rank, tenure status, and other faculty classification. Scholarly Citations: Publications and creative productions by faculty members within units. Grant Citations: Grant activities and funding data by faculty members within units. Standard Vitae: Vitas for selected faculty members. Course Attachments: Courses based on types and status of supporting documentation (such as syllabus, course evaluations, peer evaluations, and more). Prior Activity Input Forms: Submitted activity input forms. Evaluations: Status and results of faculty performance reviews. Faculty Qualifications/Faculty Workload tables: Please complete a support ticket to have this functionality activated for your institution. Table 2: Years of professional experience, college teaching, years on current faculty and at present rank for full time faculty members. Table 3:Years of professional experience, college teaching years on current faculty and at present rank for part time faculty members. Table 6: Group and the percentage of total faculty that are female and male based on full-time and part-time faculty members.